From day one my students are asked to define themselves as public scholars whose contributions are not just part of “making the grade,” but also a means of breaking down the fourth wall of the classroom. Teaching in the digital age is a hybrid act that requires a fluid marriage of digital and traditional approaches to curriculum design, delivery and assessment. Blended learning, flipped classroom and peer-to-peer assessment are key elements of this. Underlying truly meaningful and deeply skilled teaching with technology, TPACK is different from knowledge of all three concepts individually. 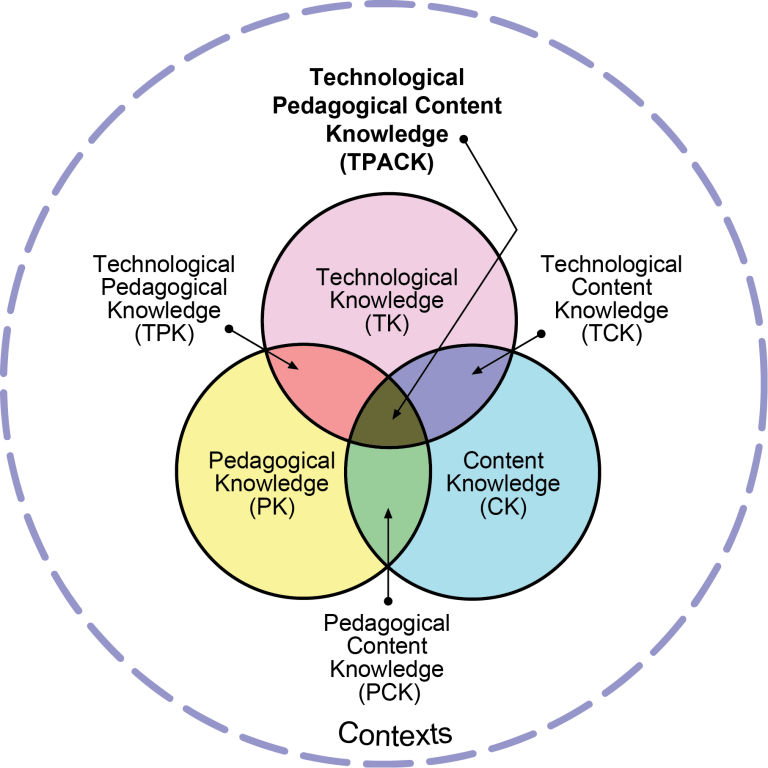 Instead, TPACK is the basis of effective teaching with technology, requiring an understanding of the representation of concepts using technologies; pedagogical techniques that use technologies in constructive ways to teach content; knowledge of what makes concepts difficult or easy to learn and how technology can help redress some of the problems that students face; knowledge of students’ prior knowledge and theories of epistemology; and knowledge of how technologies can be used to build on existing knowledge to develop new epistemologies or strengthen old ones. TPACK supports the myriad of digital and face-to-face pedagogical situations that we find ourselves in in a world that is increasingly wired and networked. I do not discourage students from using the word “I” in their work, but rather encourage them to use their critical “I/eye.” In this way they can be self-reflective while also exploring their critical voice and training their scholarly eye to seek out, evaluate and integrate relevant sources, ideas and methods into their own discourse. I aim to inspire students to see critical potential in every space by assigning unusual and unexpected tasks to them. The Twessay or Twitter essay assignment that I designed for students in Concepts and Collaboration in Digital Arts and Humanities I (DH1001) is an example of my innovative method of assessment. Students had to write a 140 character essay, and then critique a number of Twessays written by their peers. Therefore, using peer to peer assessment, blended learning, and a reconfiguration of the essay students were encouraged to look beyond the flatness of the traditional page when constructing an essay and learn from one another’s approaches. My instruction for their first Twessay, for instance, was “Write an essay on #openness in 140 characters that explores the term using #DHUCCtwessay. Play, experiment, explore. Don’t waste a character.” Students used emojis, gifs, memes, online articles, as well as playing with the structure of the tweet itself to construct their Twessays. Their critical responses to one another’s work allowed them to engage with peer-to-peer assessment, draw comparisons and explore the kind of depth that a 140 character tweet can have. An example of these critical responses, which were posted on their blogs, can be read here. Empowering students to take control of their learning is an essential component of my pedagogical philosophy. The flipped classroom approach provides such a means of inspiring students, and I often use this technique when teaching research methods modules. An example of this is my unconventional use of Wikipedia to introduce Masters of English students to the concept of open access, the value of digital tools, and the usefulness of markup languages for text-based research. Students were tasked with the responsibility of learning the fundamentals of Wiki markup, deciding on an article to edit, and researching their topic before participating in a Wikipedia Editathon which took the place of their usual research methods lecture. This empowered the students to showcase their research skills and demonstrate their ability to learn new ones on their own initiative. Their task included live tweeting their progress throughout the Editathon, and write a blog post summarising their process and results following the event. Rather than taking home individual assignments or sitting in silence in an exam-style situation, the students collaborated, advised and encouraged one another. Their live tweeting of the Editathon reached an audience beyond the classroom, providing an added lesson in the importance of disseminating and promoting their research. Student assignments should not be relegated to filing cabinets upon completion. I ensure that my assessment design places emphasis on the use of open source, public tools and platforms to research, create, and publish assignments. Moreover, examining and critiquing the research process is key. Thus, in Concepts and Collaboration in Digital Humanities I and II (DH1001; DH1002) I schedule submission dates for blog posts throughout the semester in order to give students individual feedback on early work, and an opportunity to defend their choices and edit their work as required. Blogs and collaborative writing tools like Google Docs allow students to draft, reflect, revise, critique and publically showcase their work. OA platforms such as crowdsourcing projects like Wikimedia offer students a means of garnering technical expertise while putting their conceptual ideas and research processes into practice. The presence of the unknown public audience as well as that of their instructors and peers inspires diligence and care towards their work, and a sense of professionalism that prepares them for future work environments. My reputation as a committed and talented teacher extends beyond the university. I was invited to judge the 2016 Undergraduate Awards because: “One of [your] past students, Cian O’Connor, was a Winner in the 2015 Undergraduate Awards competition. This award is a testament to the excellence of your teaching and as such, we would like to invite you to be part of one of The Undergraduate Awards 2016 panel of judges to identify other brilliant students from around the world” (Email received from UA Operations Manager, 07 June 2016). Most recently, the DAH teaching team have been nominated for a 2015/2016 UCC President’s Award for Excellence in Teaching. The nomination by a graduate of the MA in Digital Arts and Humanities speaks to the quality of our collaborative teaching. In response to one of my seminars on digital research and dissemination (LL6901), an MA student emailed me to say, “It was one of the most practical seminars I’ve had since beginning the MA and I think the links and advice you provided will prove to be extremely useful. Even though my chosen field might not be what some people would consider ‘useful’, everything you said was reassuring and gave great food for thought, which isn’t something that happens every day!” Another student wrote in an evaluation of Editing Skills for Research Postgraduates in Humanities and Social Sciences (DH2011), “lovely presentation style – complex topic but easy to listen to.” The consistently positive feedback I receive from students is also a testament to the effectiveness of my approaches.